Having the second most wins in the NBA has certainly generated enthusiasm around the Toronto Raptors. So much so, in fact, that the Raptors saw a significant spike in ticket prices between the start of the season the midway point. The average asking price for a Raptors ticket rose 44% from $178 to $256 by mid-January, making a ticket to Toronto's Scotiabank Stadium the fifth most expensive across the NBA, according to secondary ticket marketplace TicketIQ.com. The increase is the biggest in the NBA, but only the third biggest move, as Chicago Bulls and Sacramento Kings tickets are now 50% cheaper than they were at the start of the season. Once one of the glamour teams in the NBA, the Bulls have struggled not only to maintain that glitz, but also to win. Plagued by injuries, the Bulls have won only 12 games as of February 7th. Ticket prices fell from an average of $247 at the start of the season to $123 by the midway point. Sacramento hasn't been having quite as much trouble winning —they're two games above .500 as of February 7th. 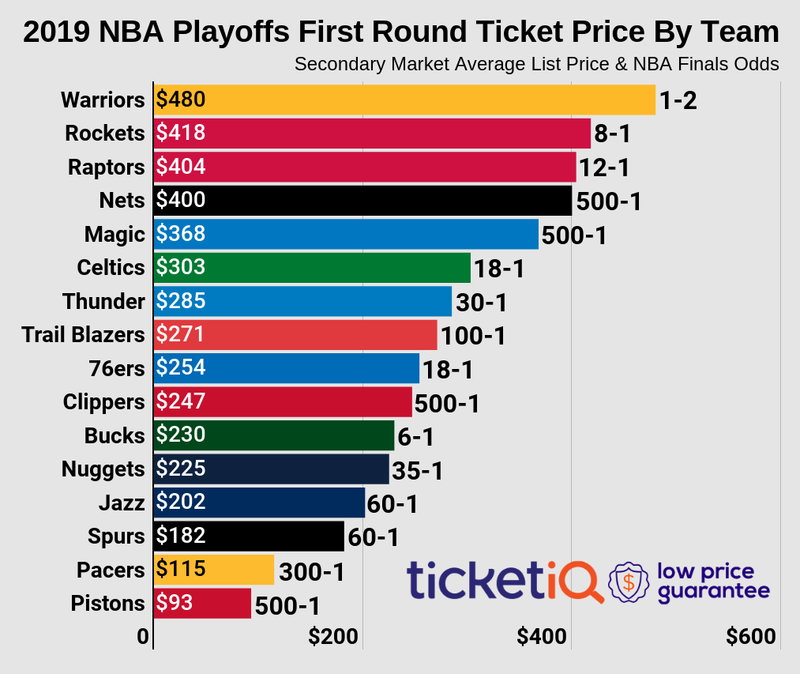 Despite that, the average asking price for tickets dropped from $127 to $64 at the midway point, making them the second cheapest team in the NBA, according to TicketIQ.com. Of the five teams with the highest tickets average asking prices and the five with the lowest at the midway point, below is a look at where those teams started the season, and where they are now. 1. Golden State Warriors: At $522, the Warriors own the priciest ticket in the NBA. That's no surprise because they're the defending NBA champions and, well, have had a stranglehold on the league for most of this decade. Golden State started the season ranked No. 1 in terms of average asking price, and prices have risen nearly 13% from $463. 2. Los Angeles Lakers: The only other team to break the $500 barrier, the Lakers are benefitting from LeBron James' move out West ... even though he's been out of commission since Christmas Day. The Lakers are commanding $514 on the secondary market, up 11% percent from the start of the season. Los Angeles was ranked No. 2 in terms of price when the season started and at the midway point. 3. Boston Celtics: Led by a surging Jaylen Brown, the Celtics are movin' on up, from the fifth most expensive secondary market ticket price at the start of the season to No. 3 at the halfway point. The average asking price in Boston has risen 22% percent from $225 to $274, and the Celtics have been among the top teams in the East all season. 4. New York Knicks: The Knicks and Madison Square Garden remain amongst the biggest draws in the league. New York opened the season with the third highest average asking price on the secondary market, and are fourth at the halfway mark. 5. Toronto Raptors: As noted above, Raptors tickets have jumped the most of any of the teams ranked in the top five by price. Along with Boston, New York and No. 6 Brooklyn ($206), the Raptors are one of four teams with an average asking price over $200. Just missing the top five: Brooklyn Nets ($206), Oklahoma City Thunder ($191) & Houston Rockets ($189). 1. Detroit Pistons: Detroit has the dubious distinction of being the cheapest ticket in the NBA both at the start of the season and at the midway point. Fans are finding it tough to rally around a team with a losing record, though they're not the worst team in the league when it comes to wins and losses. With regard to ticket averages, Pistons prices fell 24% between the start of the season and February 7th. 2. Sacramento Kings: As noted above, the Kings are one of two teams whose average asking price dropped 50% between opening day and the midway point. The Kings started the season ranked No. 18 in terms of average asking price, and are currently at No. 29. 3. New Orleans Pelicans: This team started the season with the second cheapest ticket in the NBA, and despite the average asking price falling further still, it was ranked No. 28 at the halfway point. Pelicans tickets started the season with an average asking price of $84, but have dropped 11% to $75. The Pelicans aren't having a winning season, and the main reason for going -- star Anthony Davis -- is seeking a trade. 4. Charlotte Hornets: Like the Pelicans, the Hornets have watched their average asking price drop about 11% since the start of the season, but they too moved up in ranking. Now at No. 27, Charlotte prices have fallen from $89 to $79, as the team puts a sub-.500 product on the court. 5. Phoenix Suns: As the Suns have struggled to find any way to win -- they had only 11 wins as of February 7th -- fans have driven prices down just over 8% since the start of the season. The Suns started the season commanding $106, but that number is down to $97. Phoenix was ranked No. 24 in terms of price at the start of the season, and is now No. 26. Just missing the bottom five: Orlando Magic ($98), Indiana Pacers ($101), Memphis Grizzlies ($107). Toronto Raptors: The biggest mover among teams that had a price increase between the start of the season and the midway point, Raptors tickets rose nearly 44% from $178 to $256. In terms of overall rankings, Toronto moved from the No. 10 most expensive ticket to No. 5. Boston Celtics: The Celtics had a first-half increase of almost 22%, moving them from having the No. 5 most priciest ticket to No. 3, behind only the Golden State Warriors and Los Angeles Lakers, the only two teams with ticket averages higher than $500. Boston tickets cost an average of $274 now, versus $225 at the start of the season. Portland Trail Blazers: Portland isn’t fighting for a spot among the Top 10 priciest tickets, but the average asking price jumped nearly 21%, the third biggest increase, and that moved the Blazers from having one of the cheapest tickets in the league to the middle of the pack. The Blazers started the season ranked No. 27 in terms of ticket price with a $92 average asking price, but moved up six spots to No. 21 with a $111 average asking price. Milwaukee Bucks: Milwaukee’s 15% increase in average asking price put it among the Top 10 most expensive tickets in the league. Currently ranked No. 9 in terms of price, the average asking price for a Bucks ticket moved from $153 to $176 during the first half. Milwaukee started the season ranked No. 12 in terms of average asking price. Golden State Warriors: The priciest ticket in the NBA got even pricier during the first half. The Warriors started the season ranked No. 1 in terms of average asking price and stayed there, as the average asking price moved from $463 at the start of the season to $522 at the midway point. The only other team with an average asking price of more than $500 is the Los Angeles Lakers, who are currently commanding $514. Chicago Bulls: The Bulls are first in the NBA … but in a category they probably don’t want to lead. The average asking price for a Chicago ticket dropped just over 50% in the first half, from $247 to $123. The Bulls started the season with the fourth priciest ticket in the league and, but dropped 15 spots and were ranked No. 19 by the midway point. Sacramento Kings: Not far behind the Bulls, Sacramento watched its average asking price plummet by just under 50% through the first half. Ranked No. 18 at the start of the season with a $127 average asking price, a Kings ticket is now averaging $64, making it the second cheapest in the league. Detroit Pistons: The average asking price for a Pistons ticket was the cheapest in the NBA at the start of the season and again at the midway point. But the average asking price hasn’t been static – it fell nearly 24% from $76 to $58 between the start of the season and February 7th. San Antonio Spurs: With a drop of nearly 22 percent in average asking price, San Antonio had the fourth biggest decline in ticket prices during the first half of the season. The Spurs started the season ranked No. 7 in terms of average asking price, and are now ranked No. 12 as prices fell from $197 to $154. Philadelphia 76ers: Philadelphia is till in the Top 10 in terms of average asking price, but just by a hair. The Sixers watched ticket prices fall just over 11% from $192 at the start of the season to $170 by February 7th. Philadelphia was ranked No. 8 in terms of average asking price at the start of the season, but was at No. 10 by the halfway point.